John W. Clark is a partner in the firm of DuCharme, Clark & Sovern, LLP in Clifton Park, New York. He is a graduate of Rutgers College with a degree in Business Administration and received his Juris Doctor from Wake Forest University School of Law. He is a retired Major General having served on active duty in the Air Force, and thereafter with the Air National Guard and United States Air Force Reserve. He was the 5th Judge Advocate in the history of our nation to be promoted to the Two Star rank within the Air National Guard where he served as the ANG Assistant to the Judge Advocate General of the United States Air Force from 2003 to 2006. His civilian practice areas include Estate Planning, Elder Law, Real Estate, Labor Law, General corporate practice, and representation of fire districts and fire departments. He is a member of the Elder Law and Estate and Trust sections of the New York State Bar Association and was a founding member and original secretary for the Elder Law Committee of the Albany County Bar Association. 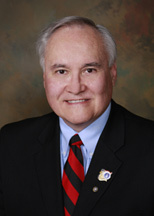 He is a member of the National Academy of Elder Law Attorneys and has been a speaker at New York State Bar Association sponsored seminars on Elder Law, Nursing Home Discharge Planning, Medicaid Eligibility, Long Term Care Insurance, Estate Planning, Fair Hearing processes, Advanced Estate Litigation, and Adult Guardianship proceedings. Much of his work is management side labor law. He has over 2000 hours bargaining table time as Chief Spokesman in union negotiations. He has represented companies in fighting unionization efforts and election campaigns as well as unfair labor practices and defense of discrimination claims. He provides daily advice on general labor and employment law compliance to various corporate clients. He is a member of the New York State and American Bar Association Labor and Employment Law Sections and has been a featured speaker at continuing legal education seminars for practicing attorneys at New York State Bar Association sponsored events. Representative Clients: The College of Saint Rose, Adirondack Beverages Corp., St. Catherine’s Center for Children, B. Lodge & Co., Midway Fire District, West Albany Fire District, Stanford Heights Fire District, Niskayuna Fire District No. 2, Fuller Road Fire Department, Latham Fire Department, Shaker-Road Loudonville Fire Department.